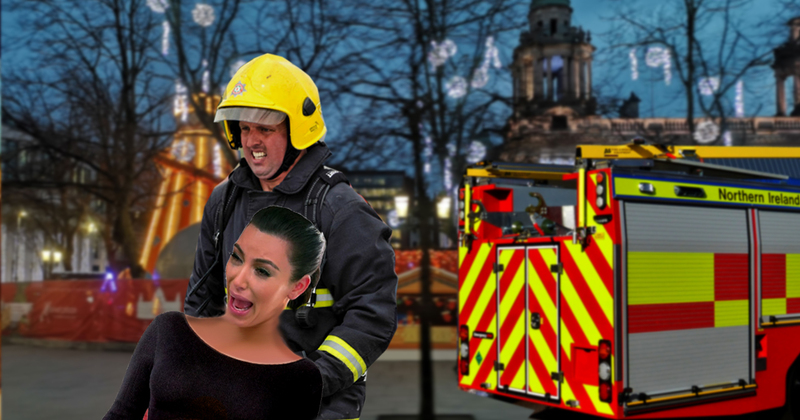 The emergency services were sensationally called to Belfast’s Christmas Market today after top celebrity Kim Kardashian got her huge arse wedged on the slide of the helter-skelter. No fewer than four fire appliances and a coastguard helicopter were needed to extricate the star from the fairground ride, in what some experts have described as the most intricate arse related rescue operation in the history of Belfast. The incident comes after it was revealed that the market has become a huge draw for international celebrities, with dozens flocking to the city to experience the sights, sounds and smells of the event. The organisers hope that what’s become known as the Kardashian Arse Incident won’t put stars off making the journey. Breaking News. Emergency services have been called to Royal Avenue where an unnamed celebrity has got her arse stuck in the snow slide.